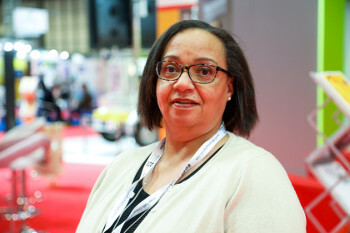 On the opening day of Traffex, Helen Aluko-olokun (pictured below), policy business partner at Guide Dogs, took part in a key session on inclusive mobility, which made the point that ‘if you don’t actively include all travellers in your planning, you will end up excluding people whether you mean to or not’. Transport Network caught up with Ms Aluko-olokun before her presentation and the issue of how blind people can often be unnecessarily excluded by poor street design very quickly came to the fore. ‘My remit is the street and built environment and I’ve worked for a number of years now with local planners, designers, transport planners, looking at how to make the external environment accessible. What we have all the time being thrown back to us is that designing for people with disabilities is not that fancy, it’s going to be looking boring, and stuff like that. ‘It doesn’t necessarily have to be like that, with technology, the way it’s going, smart technology especially, the fact is that we shouldn’t even be thinking it’s not aesthetically pleasing. 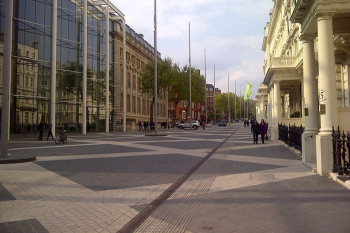 Unsurprisingly, the recent decision of Kensington and Chelsea council to reinstate street furniture in the flagship shared space scheme on Exhibition Road, South Kensington, has not escaped Ms Aluko-olokun’s attention, albeit that she says “we told you so” in an inclusive way. It has been suggested that the issue with shared space is not so much that blind and partially-sighted people are being injured but that they are being designed out; there is a feeling that they can't access those streetscapes in the first place, so that accident statistics only tell half the story. ‘This is a conversation I had as far back as 2007, when they said, by installing shared surfaces there are no accidents and I said, have you got statistics to prove how many disabled people use that environment and how many of them are still using it? ‘And the answer was, no we don’t have that kind of data collection. Why? The reason you don’t have that data is because they don’t turn up, and if they don’t turn up, you’re not going to have accidents. That is the wrong measure to use to classify whether a scheme is successful – the rate of accidents. But Ms Aluko-olokun’s message remains positive: ‘I’ve been around Traffex and I’ve looked at some stuff and there are some pretty good things coming out, technology- wise, that can help to make sure that this environment can be accessible for blind and partially-sighted people and other disabled people. ‘I had a look at a stand called Tac-Grid and they have designed tactile paving, which will have technology built into it that combines with your long cane or smart shoes, which is just an insole, and it tells you what’s to your left, what’s to your right. And it’s actually, the installation of it is said to be two-thirds cheaper than putting concrete down.